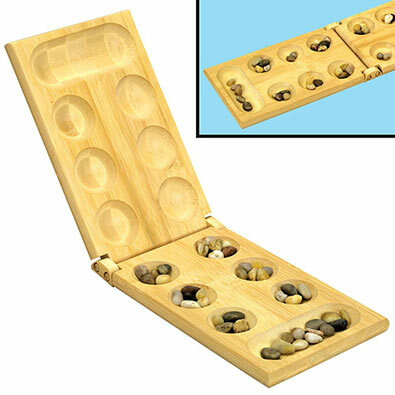 The classic counting game made of smooth bamboo and multi-coloured natural stones. Move the stones around the board following the rules of the game. Collect the most stones in your mancala to win. Folds for easy transport and storage. Game board measures 45cm x 13cm x 3cm. Recommended for ages 13+. Here's a venerable challenge that could humble even a Japanese emperor. The object is to remove the pieces one by one without the spring loaded arm sending the other pieces flying. Accumulate points by pulling and collecting coloured pieces. Play solo or compete with other players. Measures 29cm x 18cm. Recommended for ages 8+.